When the Duke men’s lacrosse team takes the field each weekend in the spring, the players’ uniforms bear a subtle yet powerful tribute to one of their own. The insignias honor the late Sgt. James John Regan, or “Jimmy” as he was known at Duke. The Long Island native was a midfielder for the Blue Devils from 1999-02 and was killed in action in 2007 while serving in the United States Army’s 3rd Battalion, 75th Ranger Regiment in Iraq. A native of Manhasset, N.Y., Regan was born in 1980 to James and Mary Regan. He graduated from Chaminade High School in Mineola, N.Y., and went on to play lacrosse and study economics at Duke. The midfielder helped guide the Blue Devils to a four-year record of 43-21 with a pair of ACC titles in 2001 and 2002 and four NCAA Tournament appearances. He was named to the 2002 ACC All-Tournament team after scoring a career-high four goals and adding an assist as Duke defeated then top-ranked Virginia, 14-13, in the championship game. An Academic All-ACC selection, Regan finished his collegiate career with 22 goals and four assists. Regan went on to graduate first in his class in infantry basic combat training. After completing the basic airborne course and Ranger Indoctrination program at Fort Benning in Georgia, he became a member of the 3rd Battalion. Regan served as a machine gunner, gun team leader and then fire team leader during two deployments each to Afghanistan and Iraq, as a part of Operation Enduring Freedom and Operation Iraqi Freedom. His service in the Army was to end in February of 2008. He and his fiancée, Mary McHugh, had made plans to marry and move to Chicago upon his return to the United States, and he had hopes of becoming a social studies teacher and lacrosse coach. 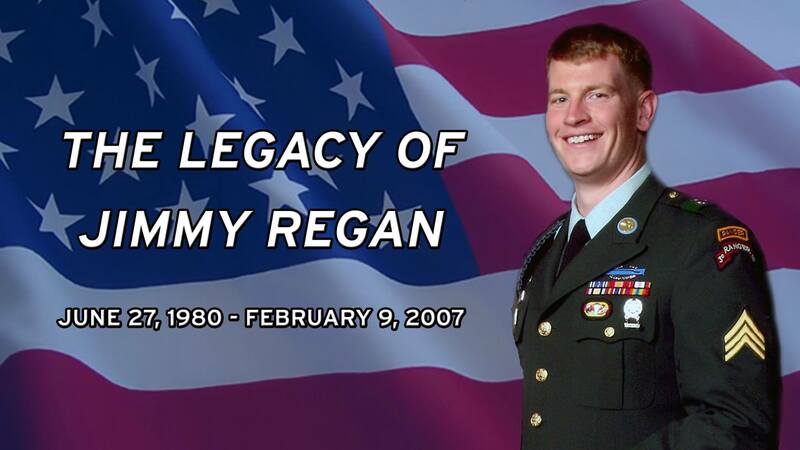 Regan was killed Feb. 9, 2007 in northern Iraq when an improvised explosive device (IED) targeted his vehicle. He was 26. Survived by his parents and three sisters, Regan was posthumously awarded the Bronze Star, Meritorious Service Medal and Purple Heart, in addition to a number of other decorations earned during his years of service. The Roman Catholic Church in Manhasset was packed beyond capacity for his funeral, including 600 flag-waving students from the local high school and many of the businesses nearby displaying his photo in their windows. He was buried with full military honors in Arlington National Cemetery. The nonprofit Army Ranger Lead The Way Fund was founded in Regan’s honor by his family and friends, and today continues to assist wounded and fallen Army Rangers and their families through health and wellness programs and other services. “Through the Lead The Way Fund, his family and friends strive to honor his spirit, his patriotism and the way he lived his life by combining our efforts to give back to his brothers, the U.S. Army Rangers,” reads part of the mission statement. Annual events such as “A Run Down Hero Highway” and the “Lead The Way Lacrosse Day for Heroes” support these efforts. In the coming months, LTWF has charity fund-raising slots secured for the San Francisco Marathon (July), the Army Ten-Miler at the Pentagon (October) and the New York City Marathon (November). A pair of “Shootout For Soldiers” 24-hour lacrosse games will be held in Baltimore and Long Island this summer. This year’s LTWF gala benefit was scheduled for May 21 at Chelsea Piers in New York, with CBS This Morning co-anchor Charlie Rose (Duke ‘64) as master of ceremonies. Regan’s father serves as the CEO of the Lead The Way Fund, with the board and advisory committee loaded with many of his son’s former high school and college friends and teammates. First Lady Michelle Obama last month commended the work done by Lead The Way in a speech she gave for Joining Forces, another military support organization she founded with Jill Biden three years ago. Although several classes of Blue Devils have come and gone since Regan’s death, his legacy continues to live on within the program. A memorial display and his framed No. 10 jersey hang outside the team’s locker room. His initials and number remain on the players’ helmets for every game. With the return of defenseman Casey Carroll to Duke last year, the reminders of Regan’s service to his country have been even more constant. Carroll was a first team All-America selection for the Blue Devils as a senior in 2007. He cites Regan’s story as being influential in his decision to also join the United States Army following graduation. Coming from a family that had ties to military service as well, Carroll enlisted in the 3rd Battalion, 75th Ranger Regiment — the same unit Regan had served in. After spending 2007-12 in the U.S. Army with tours in Iraq and Afghanistan, Carroll returned to Durham to pursue an MBA at Duke’s Fuqua School of Business. With one year of eligibility remaining due to injury, he was also able to get back on the field for the Blue Devils, joining his teammates in honoring Regan every time they don their helmets. And although Carroll tends to shy away from the spotlight, he is eager to share Regan’s story. For more information on the Lead The Way Fund, visit leadthewayfund.org.